Seven members of one family were among the 23 victims identified after an outbreak of tornadoes devastated the US state of Alabama. The victims range in age from six to 89. About 50 structures have been reduced to rubble. On Monday, a tornado hit Lee County to EF-4 with wind speeds of 170 mph (275km/h). 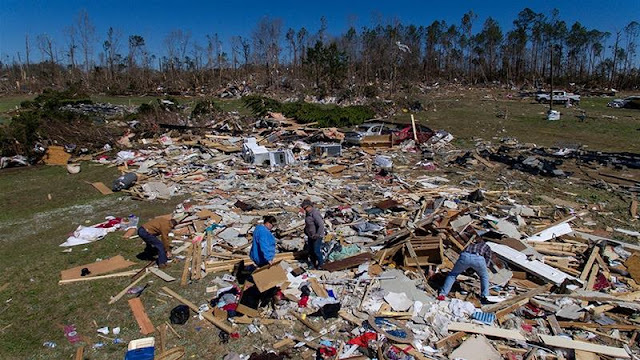 During Tuesday's briefing, an official with the National Weather Service said the deadliest tornado had travelled for about 70 miles, and another nearby travelled for 29 miles. The Most Reverend Thomas J. Rodi Archbishop of Mobile Deeply saddened to learn of the tragic loss of life and the injuries caused by the tornado which struck Alabama in recent days, His Holiness Pope Francis expresses heartfelt solidarity with all affected by this natural disaster. He prays that Almighty God may grant eternal rest to the dead, especially the children, and healing and consolation to the injured and those who grieve. Upon all who are suffering the effects of this calamity, the Holy Father invokes the Lord’s blessings of peace and strength.